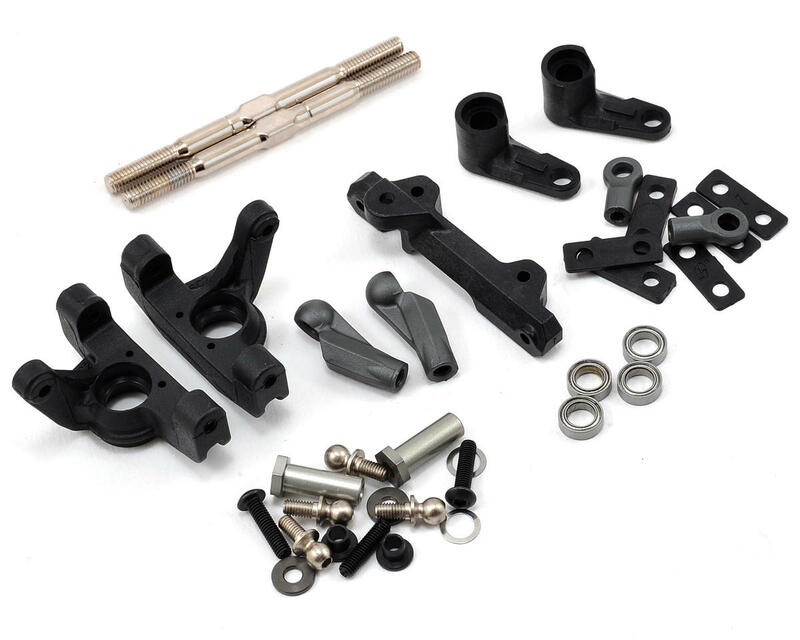 This is an optional Team Losi Racing Bell Crank Steering System. 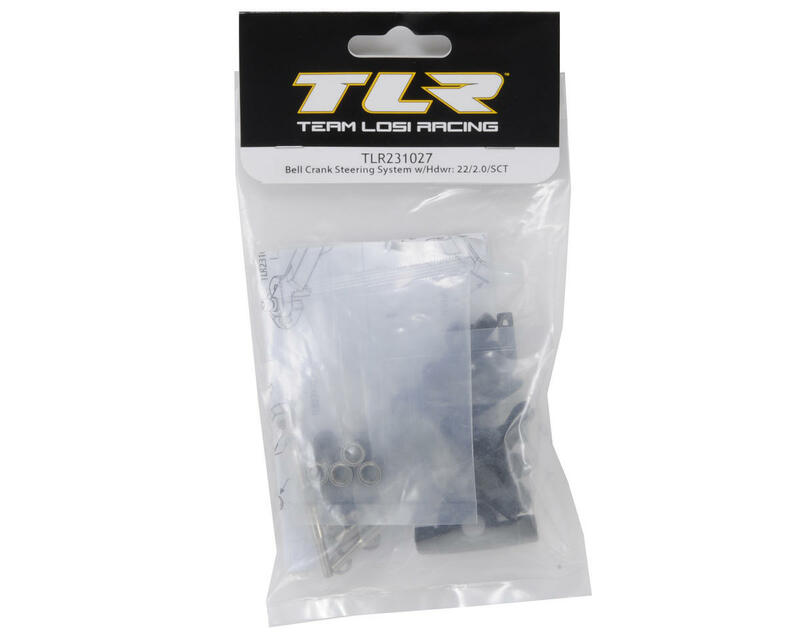 During their extensive testing, TLR found a distinct advantage to a bell crank system for the Team Losi Racing 22 platform vehicles (22, 22 2.0, 22SCT, & 22SCT 2.0). The bell cranks create less Ackermann throughout the turning throw making the vehicle less aggressive off-center and adding steering low speed with a greater outside wheel angle. This is a directly bolt on for all 22 platform vehicles and includes ALL parts required including a 22 2.0 and 22SCT specific spindle and an M3.5 x 50mm HD Turnbuckle (22, 22 2.0) to convert your TLR vehicles. NOTE: This bell crank system can work with the 22T as well, but it does not use the updated sprindles and requires TLR6065 Turnbuckles, 22SCT as well. My first experience with the bellcrank steering system was in the 22SCT 2.0 and I was really impressed with how well that truck steered, given it's incredible wheelbase. I decided I'd try out the bellcranks in my 22 buggy since my stock steering rack was developing some slop and it often felt "sticky" in places, despite lubrication. I definitely noticed an immediate difference in steering behavior; the buggy seemed far more authoritative with steering. I was always fighting a heavy on-power push before and after the bellcranks it lessened significantly. The buggy had a lot more "driveable" steering, especially at low speeds and the whole steering system felt much smoother as a result. It took me quite awhile to get adjusted to the different handling characteristics, but once I did it felt a bit easier to drive. The installation was easy and pretty straightforward with the included instructions. My only real complaint with the system is that the included instructions did not have any turnbuckle measurements to follow. So, once it was installed I had to break out my calipers and ruler to make sure my toe was equal and the buggy tracked straight. Having a 1:1 diagram or even just suggested lengths for the turnbuckles included would have helped get the buggy up and running a bit faster. 13 customers found this review helpful. Great upgrade for the original 22 1.0, and gives a few more degrees of steering lock, perfect for indoor carpet turf tracks. Got rid of the slop, and makes steeering a little more accurate. Don't worry about the lock nut comment review, as the nut is used from the standard set up that comes off the car. A little tricky to fit, especially the washers on top of the bearings, but worth the time it takes. Does not include the 4-40 Nylock nut in diagram 1. Part# LOSA6306 is needed, which is $9.99 for a package of 10 I believe. Or you can go to any fastener store or box store a get a package for about $1.50. It doesn't even show the nut in the picture. which I think should be included in the package since it cost $9.99. Not Amain.com fault, TLR is to blame.